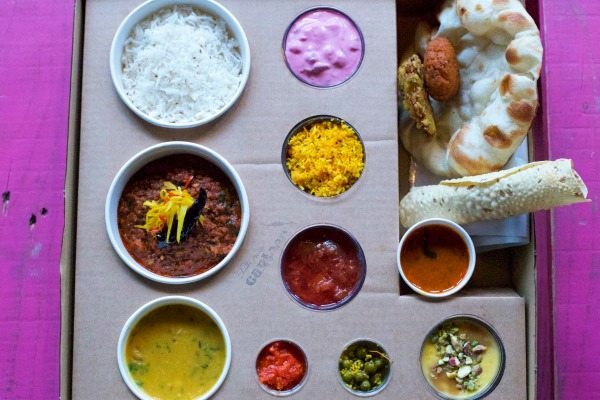 This evening’s dinner should be one to savour, being as it’s coming from the Brighton institution that is The Chilli Pickle Canteen via gourmet takeaway specialists Deliveroo. The Chilli Pickle restaurant originally opened in the The Lanes area of the city on Meeting House Lane and swiftly forged itself a glowing reputation for incredibly flavoursome Indian food. A few years later it relocated to a larger setting, occupying the restaurant space in My Hotel where it currently resides. The Chilli Pickle Canteen was launched more recently to provide a dedicated delivery service. Here the diner can order Grand Thalis, Railway Trays and Biryani Sets. 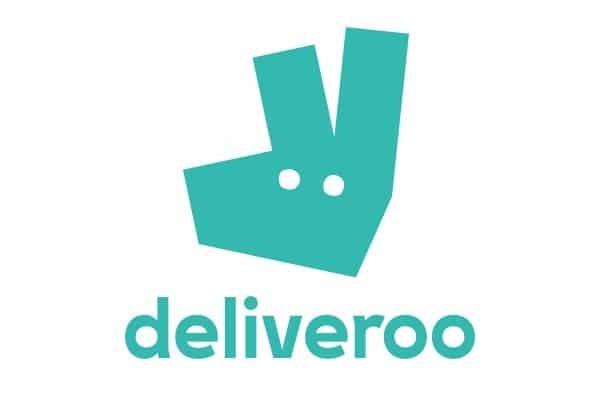 You can of course enjoy these delights by going online to the Deliveroo website, the process of which couldn’t be easier. When the diner enters their postal code this determines what restaurants are presently available to order from. Select the time for the meal to arrive, followed by the restaurant of choice. Order from the menu as normal, pay the bill and the deed is done. Now it’s time for the restaurant and Deliveroo to get to work. 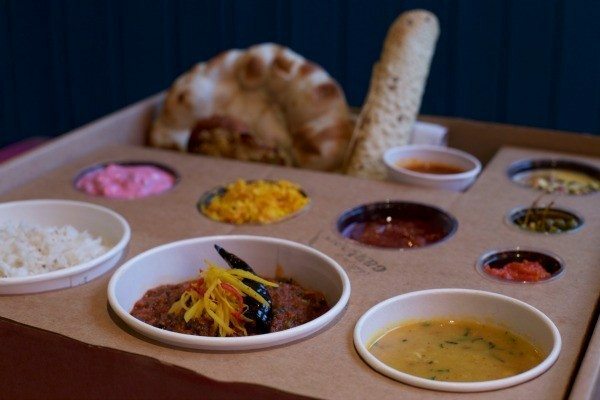 My partner and I have each ordered a Grand Thali; these are the ultimate TV dinners, with all the Thalis components set in an elaborate self-contained presentation box that can be eaten directly from. There are several types of Thali listed online, each with a central dish and then the same array of accompanying sides (though these change regularly). The Thali is what the Chilli Pickle Canteen is best known for. We’ve opted for the Seabass Moilly Pot and Chicken Xacuti. There are of course vegetarian options – Paneer Karai as well as a Rajasthani sweetcorn curry and other carnivorous choices too. Kashmiri Gosht, a spicy slow cooked mutton or a Chicken Chilli Bhuna to name a few. The food duly arrives on time. 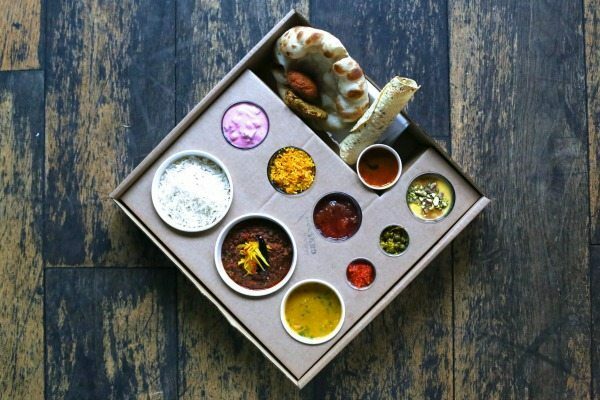 The Thali box has been designed with transportation in mind so everything is intact and piping hot – not just warm. Each Thali features 13 different components; the curry, rice, raita, pakoras, pickles etc, which are conveniently listed on a compliments slip from one to thirteen, so you can check to see what you’re eating. The Xacuti is a Goan dish, fragrant with roasted coconut and masala. Tender chunks of chicken thigh and leg meat bathe in a rich tomato based sauce. It is sumptuous and warming. My partners Keralan Seabass hits the spot too. It’s a marginally lighter alternative to the chicken with the aroma of ginger and curry leaves entwined in a tangy coconut gravy where delicate morsels of seabass lurk. The accompanying rice is well cooked, fluffy and wafts pleasantly of green cardomam. These are not your run of the mill curries, takeaway or not, they are operating on another level. Beyond these central dishes the rest of the Thali takes on an explorative angle as you make your way through all the other goodies, referencing that numerical run down of what’s in the box as and when you feel the need. The flavours are fulsome, vibrant and intense yet contrast nicely as well. We tuck in first to some Tamil Rasam; a small unassuming tub that turns out to house a concentrated tomato soup with mushrooms, pepper and a healthy thwack of chilli heat. The Cauliflower Pakora is crisp and flavoursome while a Rice Pepper Cheese kebab complete with a gooey centre lulls you into the realms of comfort food until a kick of spice puts paid to any such notion. The Toor Dal is well seasoned, earthy and robust, while the Carrot Thoran is altogether more dainty, retaining a feather light quality and coconut sweet. A redcurrant and mango chutney is also undeniably sweet but remains refreshing due to revitalizing tart acidity. There’s more too, like a delicate potato raita, a feisty tomato and raisin chutney and a wonderberry pickle! Even the poppadum cuts a sharper profile than usual, with a subtle roasted quality and a Baby Naan allows the diner to scoop up whatever sauce, pickle or chutney takes their fancy. 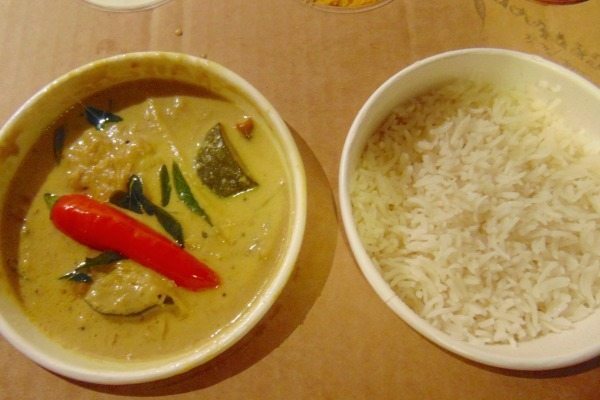 Thalis cost in the region of £16 to £18 each so delivery for two people will be in the region of £30. The Railway sets are slightly lower in price and feature less components, though from recollection the main portion of curry is larger. £30 or so might sound higher than usual for an Indian takeaway but then this is no ordinary offering. 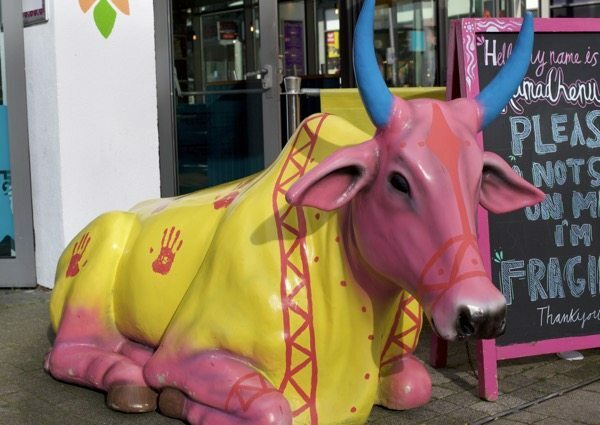 Of all the home delivery options now available in Brighton, covering a myriad of international cuisines, the Chilli Pickle Canteen without doubt ranks as one of the best, no question.